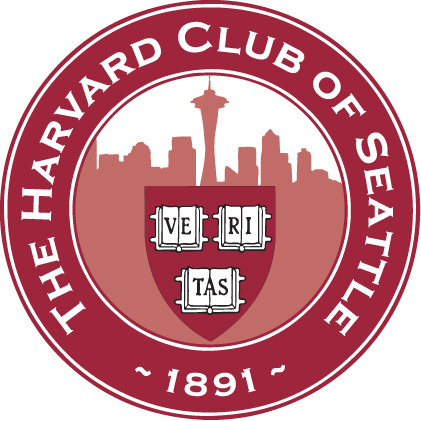 The Harvard Club of Seattle was founded on July 15, 1891 just two years after Washington became a state and five years before the Klondike Gold Rush that launched our region's growth that has continued through the aviation and technology eras. Seattle was only 40 years old, and the area had only 42,000 inhabitants, about 1% of the current population of the region. Joseph Shippen, class of 1860, then a recent transplant from Chicago, served as the Club's first president. At that time, people educated on the East Coast must have felt culturally isolated on the edge of the Pacific and probably yearned for company. 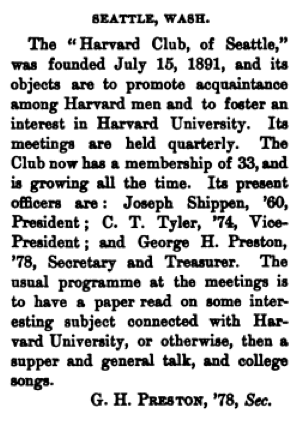 In March 1892, the Crimson reported correspondence from Mr. Shippen, indicating that the club was founded in July 1891 and that President Charles Eliot would speak in April 1892. Records show that President Eliot did indeed visit Seattle in 1892. The Club secretary submitted a note that was published in the Harvard Graduates' Magazine, Volume 1, Issue 1, p. 150, October 1892. (See document at right.) At that time, membership already stood at 33. Daniel Kelleher, class of 1885, moved to Seattle in 1890 and was a founder of the Harvard Club of Seattle. He was the second president and was serving in that capacity when President Eliot visited (in 1892). 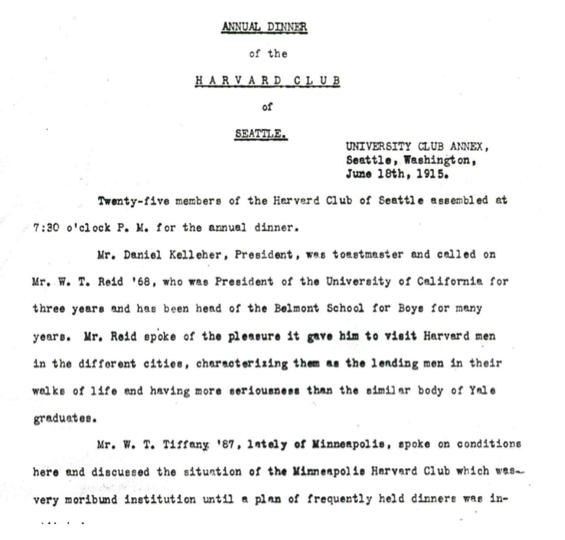 In 1905, Mr. Kelleher reported that the club had 60 members. The University Club of Seattle has a book containing the Club's minutes from 1906 to the 1920s. (See document below.) However, most of the Club's records from other years appear to be lost. The mission of the Harvard Club of Seattle is to serve the interests of Harvard University in Seattle and Western Washington, to engage in community service and educational activities, and to foster a spirit of fraternity among Harvard alumni and students.